There are more mobile devices than people on this planet; a person’s phone is their most likely window to the world wide web. Yet we’ve all visited websites on our mobile devices only to be greeted by poor UI and content obscuring ads. What use is a beautiful desktop website when a poorly optimized mobile site can kill traffic completely? That’s why this week’s #WebsiteWednesday is working to make the mobile ad experience more user-friendly – Playground.xyz. Playground.xyz is an Australian ad-tech firm that specializes in creating a user-friendly mobile experience. Playground.xyz allows designers to select from several different ad-delivery layouts, all of which integrate into mobile websites in an aesthetically pleasing and unobtrusive way. All of the designs are reactive and keep out of the way as a viewer browses a website. Not only does this make for a better viewing experience, but Playground.xyz also integrates metrics into their ad platform, so the success of each campaign can be measured. The name choice of this awesome domain stems from a tool which they call their ‘Playground’. Designers can create and preview in real-time what their ad will look like on the final website through Playground.xyz. These layouts can then be easily saved and delivered through Playground.xyz’s platform. 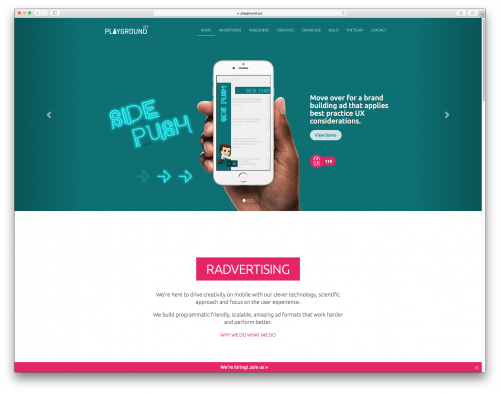 Playground.xyz found the perfect home for their intuitive ad delivery platform on .xyz, and even incorporated the xyz brand into their company name and social media branding. We love both the name and the innovative technology behind Playground.xyz.